​Booking for the term helps you commit to a yoga class and develop a supportive relationship with your yoga teacher. You'll reap the benefits of regular yoga practice, develop more quickly, practice more safely and gain the guidance of an experienced yoga teacher. If you can't make all the classes in your term booking don't worry, In most of our classes you are welcome to make up the missed class in another class. We hope this helps you keep up your yoga practice. You are able to take up to 2 classes with another teacher by prior arrangement in any term (space permitting). Please provide at least 24 hours notice to your teacher that you can't make the class so that your space may be offered to another student and confirm with the replacement class that there is a free space. All make-up yoga classes must be used in the same term. This is available in most classes however there are a few classes where this isn't possible as the class is full for the term and drop-ins are not possible for that class. Please check in with your teacher. Any questions, please feel free to get in touch and we'll do our best to help you. Good value pre-paid yoga cards that let you enjoy classes for less. Pre-pay for a class pass with your yoga teacher and use the classes within the time period with that same teacher. Your card is valid in the teacher's classes who you purchase the card from. Please see your class teacher to purchase a 5-class card or 15-class card (cheque, cash or bank transfer are all great) or get in touch with us for further details. Cards must be pre-paid to be valid. Please remember to use the classes before the expiry date. See the price list for pricing details. You can either purchase a daytime card, or an anytime card. Replacement cards can be issued if you lose your card, simply see your teacher. We keep records at the studio so all is not lost! Sorry, no refunds or time extensions. 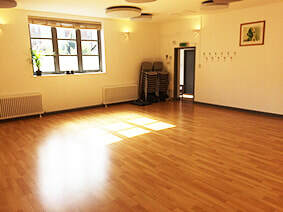 We hope you enjoy your yoga classes and look forward to seeing you in class soon.